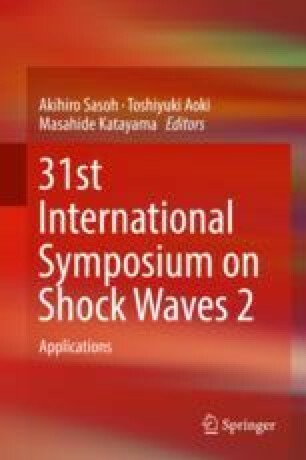 The work is dedicated to the parametric numerical study of the shock wave with the dense particle bed interaction. The problem is solved using two-fluid approach when both gaseous and dispersed phases are considered to be compressible media nonequilibrium on velocities and pressures. The determinative system of equations has the hyperbolic type and is solved using HLL numerical scheme. The statement of the problem corresponds to the natural experiment. The main features of the process are obtained in the calculations, namely, the formation of the transmitted and reflected waves and the motion of the particle cloud with sharp front edge and smearing trailing edge. The comparison of the amplitudes of the reflected and transmitted waves as well as the dynamics of the cloud motion with the experimental data is carried out. The investigation of the influence of the dispersed phase equation of state parameters and some properties of the numerical methods on the process is carried out.